The next morning we drove over the bridge to Kenya. The immigration procedure was almost as easy as it was for some of the small kids who goes to school in Kenyabut live in Uganda(some also live in Kenya and go to school in Kenya..I guess if you have a choice…). A few kilometres into Kenya it was apparent that agriculture was a way of living and some of the orchards looked really impressive with large domes covering whatever type of crops planted. We drove to a place called Kitale to exchange some money and were disappointed when we walked into the local supermarket to see that the low low Ugandaprices had come to an end at the border. The supermarket was huge and we were so overwhelmed that we forgot some of the stuff we could actually buy in such a well-stocked shop. There probably were a frozen chicken or two in the Macro-sized double storey store and Oom Nick just might have found a camping chair in their oversized outdoor department..but anyway. We drove north from Kitale to Marich where we stayed in at the very shady Marich Pass Student Centre. As we drove up north we could see the landscape gradually getting drier and drier until finally all the riverbeds were dry. At the campsite we spoke to some of the local men dressed in bee suits that showed us their novel way of collecting honey without destroying the combs. It basically works like a centrifuge relying on centripetal force to collect the honey allowing them to replace the comb after collection. By doing this they can collect honey twice instead of only once a year. The honey is subsequently weighed and sold as one of eight initiatives to help support the community. I think its pretty neat. The next morning we got up way earlier than usual to drive a 195km road from Sigor to Lake Baringa Chris and Elayne told us about. Well, technically Elayne told us specifically not to take this road whilst Chris insisted the scenery was pretty great. I for one think Elayne was right! The first part of the road wasn’t bad but once we got to the mountain pass, our average speed dropped to about 6km/h. That day we drove for a rather gruelling 10 hours to get to the Lake Baringa, a lake should actually be called the Vaaldam as it resembles dirty dishwashing water. It was rather nerve wrecking to drive on a road that you don’t know at night in an area that has problems with cattle rustlers and bandits. But we got there safely (except for some scrambled insides) at around 20h00 and had a great dinner at the local restaurant called the Thirsty Goat. 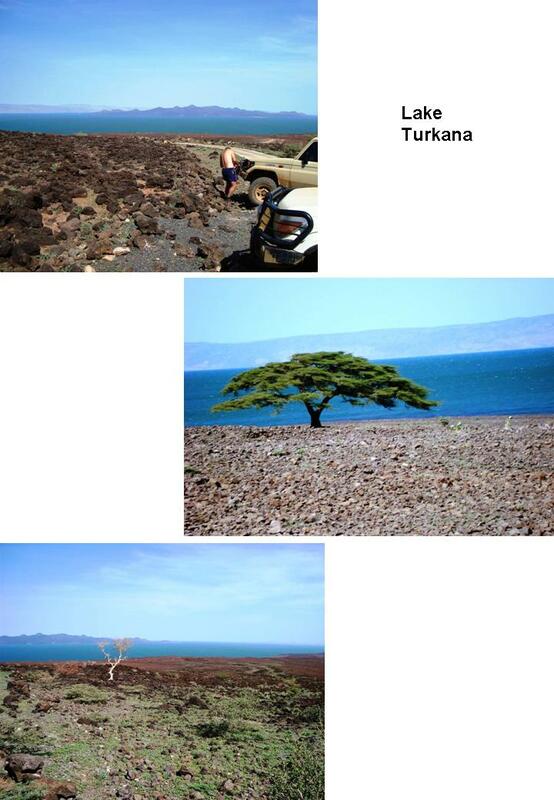 From Lake Baringa we travelled north to the eastern shore of Lake Turkana. This is the largest desert lake in the world lying in the northwest of Kenya across the border into Ethiopia. 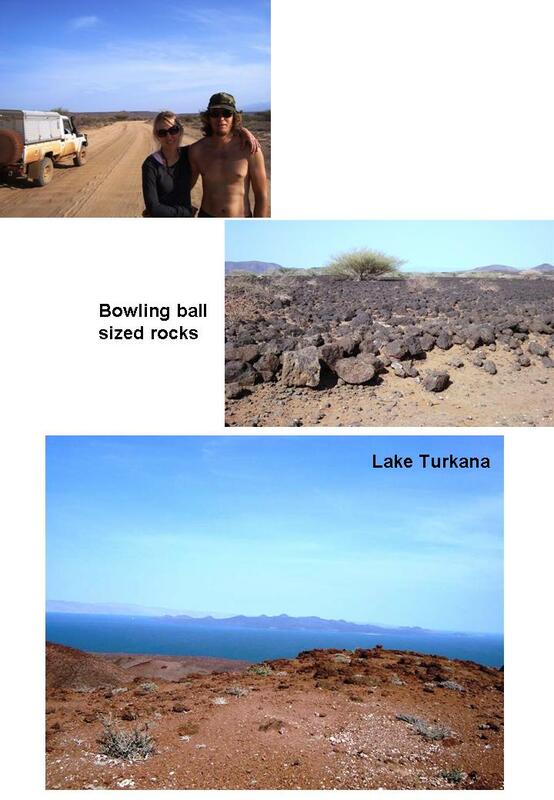 Along with a score of lakes lining Kenya, Lake Turkana shows the remains of earth’s failed attempt to tear Africa into two pieces millions of years ago resulting in the formation of the Rift Valley. Lakes and volcanoes line this valley from Egypt to Mozambique creating some of the most beautiful scenery inAfrica. To this so-called Sea of Jade, or the Jewel of the desert, we had to drive around 350 km on some of Kenya’s self- proclaimed worse roads. Our first stop from Lake Baringa would be the little town right out of the wild west, followed by South Horr and then eventually reaching Loyangalani next to the desert lake. 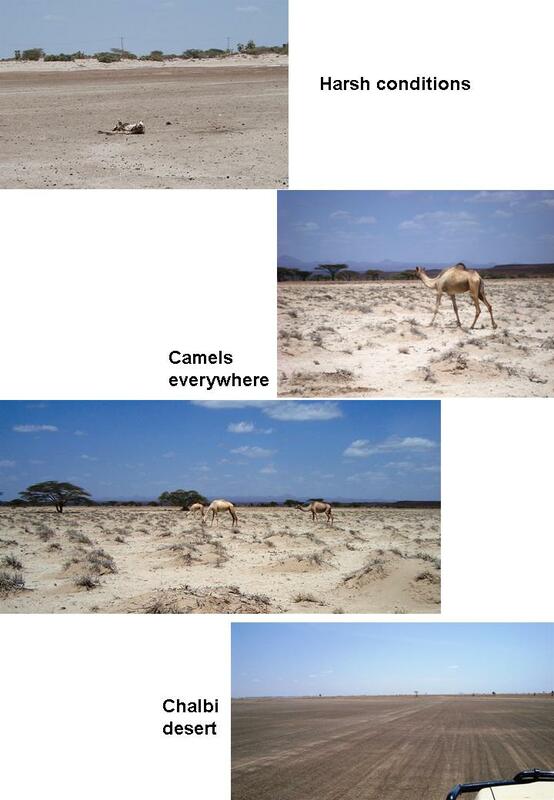 From Lake Baringa you could see tell-tale signs that there was a desert approaching…Here you didn’t see Oryx (gemsbok) and springbok as you would in the dry areas we have seen, you see camels! We arrived in the odd little town of Maralal early on a Sunday afternoon. As we had another 143km leg to do the following day, we decided to get fuel so that we didn’t have to stop the following morning. 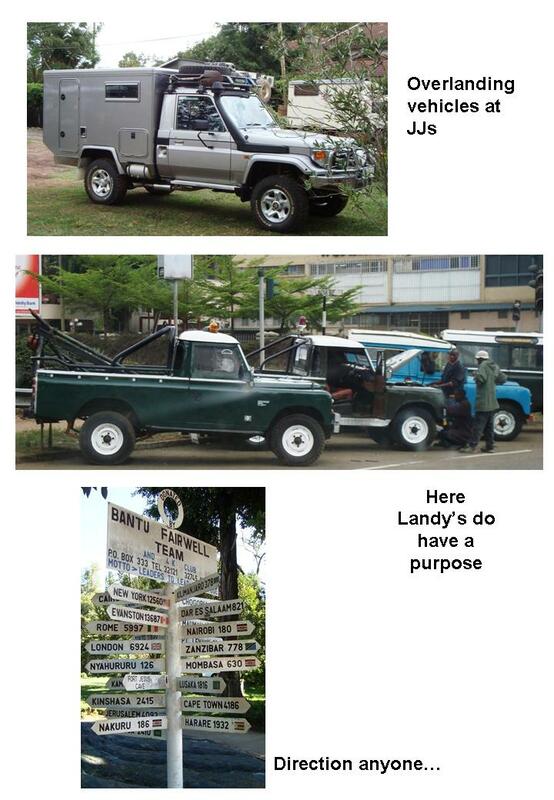 What should have been a 10min stop however turned into a two and a half hour saga… If you have read the links to the cruiser specs you would know that Marius’s Landcruiser has amongst others two standard fuel tanks, each with a 90 litre capacity. It was therefore rather interesting that the pump at the filling station was able to put 97 litres into one of these tanks before it was even full. One can make one of two conclusions .. either the tank had suddenly gotten a whole lot bigger or the more logical conclusion, that the calibration of the pump was a bit off. The attendants at the station were however more convinced of the first. It took us an hour or more to try and talk some sense into these guys, but we were not successful. We finally left paying for only 90 litres (instead of 97 litres) in that tank and 60 litres (which was more like 60 litres – 12%) in one of the supplementary tanks. 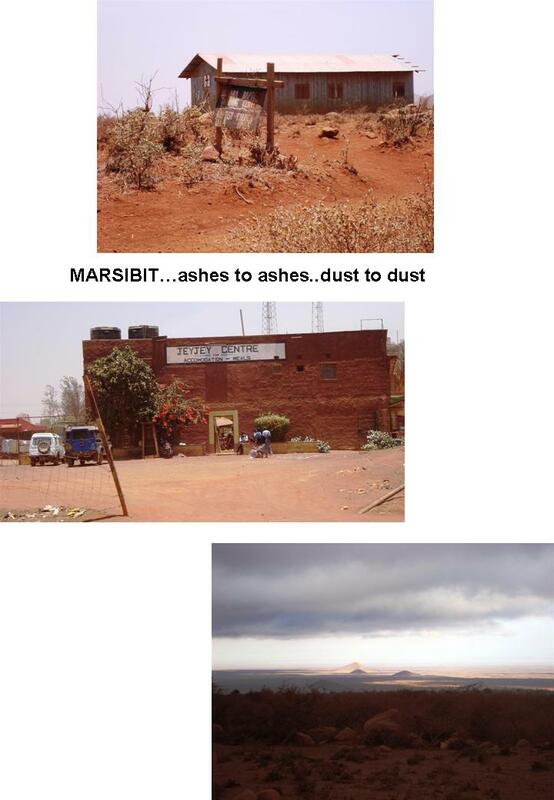 Nevertheless dusty, crazy Maralal was a wonderful place. Even whilst arguing about the petrol situation, a few guys were trying to sell us all kinds of little nothings. All of them curiously asking where we were going and where we are from in perfect English. They even looked out for their buddies in the far north by trying to convince us to buy them chewing tobacco. In fact, it seemed that everybody in Maralal were looking out for everyone else in Maralal and the North. One friendly guy insisted on taking us to the shop that sold cellphone airtime, then to various green grocers for veggies and finally to the chewing tobacco. We expected him to ask for compensation but he seem happy to have helped the other merchants make some money. Don’t think these merchant don’t try and charge you ‘Mazungu’ prices though…even when Tan Lil bought carrots for KSh (Kenya shillings) 40, the guy still tried to sell them to me at KSh100! Somehow it all seemed rather harmless though and we left with bags full of veggies, a machete, airtime and a pair of bangles representing two of the numerous tribes found in Kenya. We even went back the next morning to buy Marius and Oom Nick each a pair of shoes made locally from old tires. The old man that makes them told us that he has been making these shoes for the community for a long time and it is the best shoe for chasing after camels. All and all we could see that these people were really poor and you really feel like you want to buy their goods. 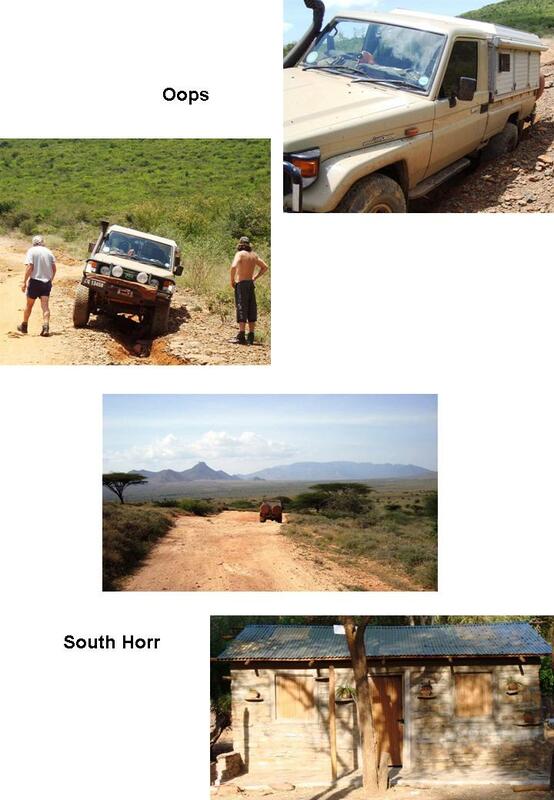 The next day we made the relatively short 90km journey to South Horr. This sleepy town lies on the banks of a dry riverbed that does see water in the form of flashfloods every now and again, but it seemed a lifetime ago. On our way there we saw some interesting cattle farmers each carrying his own AK-47 rifle. These nomadic peoples move to wherever their cattle finds food and from their dress code they likely belonged to the Samburu tribe. 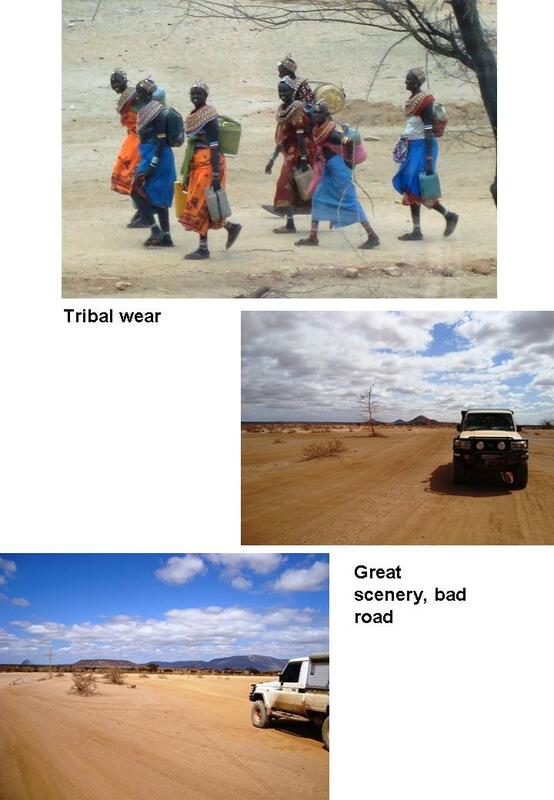 They wear red blankets draped around them like the Maasai tribe but instead of a spear they carry a gun. There’s a number of tribes inKenyabut most share customs like male and female circumcision, polygamy and very odd food. 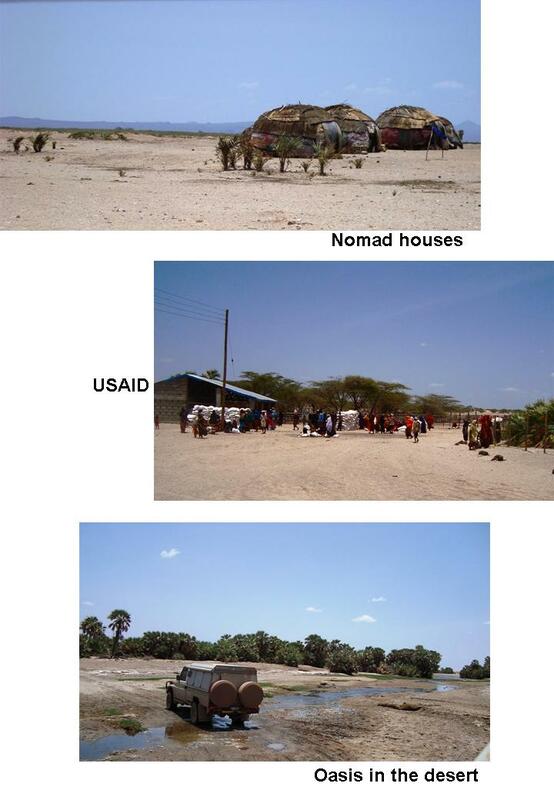 One or two of these tribes bleed their cattle/camels and then mixes this with milk as a staple food. Then they also like to combine cattle urine, ashes and sour milk….jummy! We really wanted to take a photo or two but they warn you that north Kenya is a bit volatile and we didn’t want to give these guys any reason to use those rifles. The sight of a random stranger casually carrying such a gun on his shoulders without a uniform does inspire a little fear even in the bravest of us. Beyond South Horr the dry brown shrubs scattered on a sandy surface dries up and soon all we could see was bowling ball sized black lava rocks equally distributed across the hills and valleys. It seemed as if red-brown soil had grown these rough round black rocks…we might as well have been on the moon. We were still trying to figure out how far we were from Lake Turkana when we came around a corner and saw the unreal turkois blue of the lake in such stark contrast to the red and black surrounds…it’s an image that I could never erase. We stopped to check a rattle on Oom Nick’s cruiser and I climbed a hill to see what I could see… A few hundred black stones later (with flip flops) I was on top of a hill but felt like I was on top of the world. The sight was so completely perfect that it looked fake, like a picture someone had generated on bluescreen. It was soo windy that I could hardly stand but I stayed for a while in awe of the most beautiful view I have ever seen. Photos can never do such a place justice but I include a few to try and show the amazing contrast of the area. Jade water, brown soil, black rocks and the odd green tree. It was the highlight of the trip for me so far. Descending to the lake we saw some nomadic peoples living in small round grass huts covered in empty maize bags supplied by aid relief. You couldn’t help but wonder why they would be living in these harsh conditions. 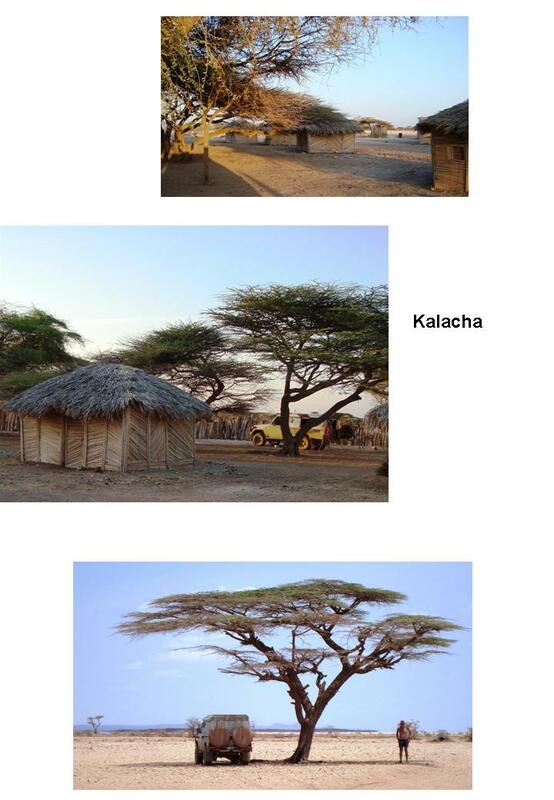 What was even funnier was that even if there were the odd tree or two, they didn’t make their huts in the shade.. Then as we went over one of the hills we saw the desert oasis that was Loyangalani. A patch of green in an otherwise dry world. 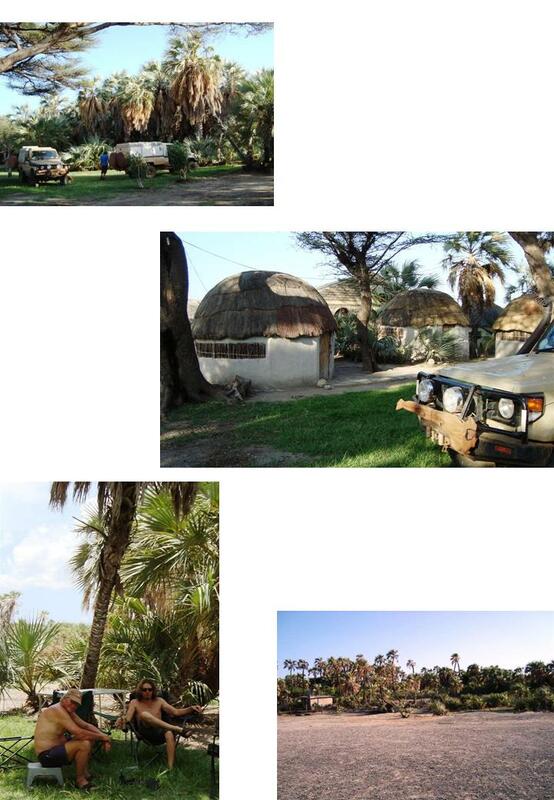 Although a good 2km from the lake shore, giant palm trees could be seen by the dozens. We drove through the dusty gravel roads of Lonyangalani and just like in the movies we drove through a gate into our very own private oasis complete with a lawn. Our host, Mr. Benedict, graciously welcomed us and we ate some supercheap tilapia fish (fresh from the lake) for lunch. It was so good that we wanted it for dinner as well, but the lake was apparently too rough for fishing that afternoon and we had a giant container full of potato chips instead. 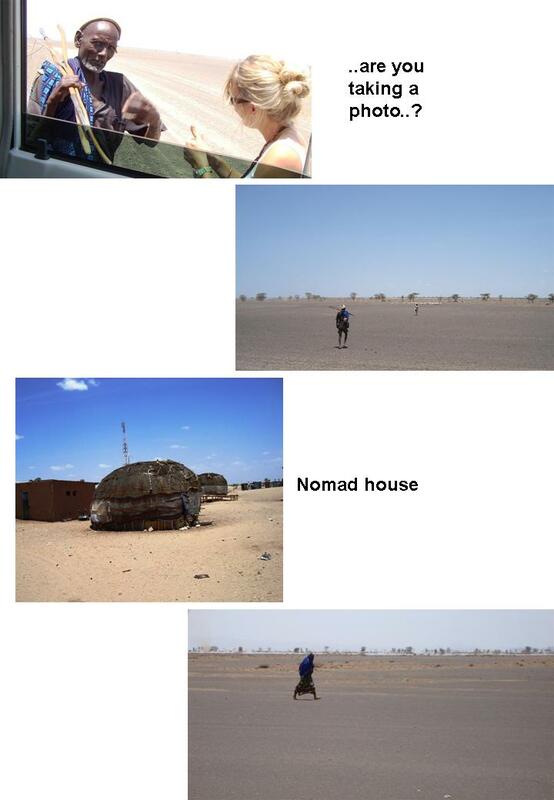 The next day we reached our most northerly point in the trip close to a desert town called North Horr. We drove through the Chalbi desert for quite a distance and was amazed that you saw the silhouette of a human every now and then in the distance. 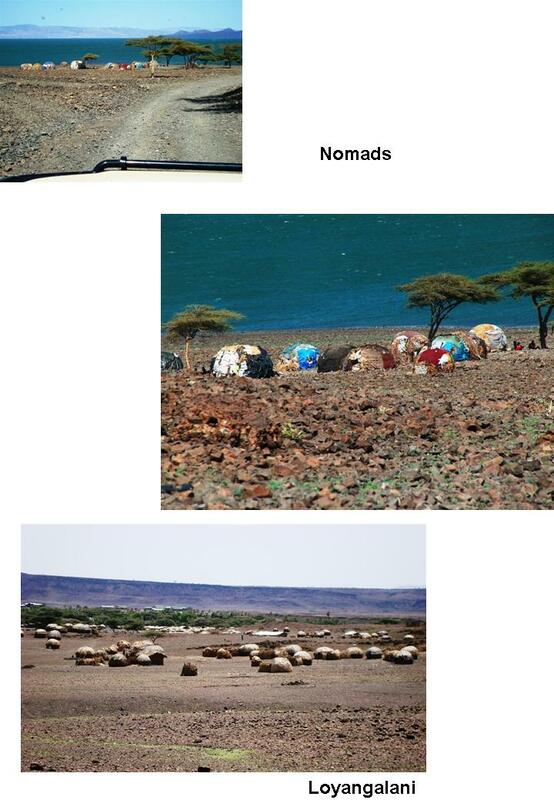 These were a different breed of nomads that seem to capable of living with little to no water. All the riverbeds were dry, and here and there you saw women collecting water from a well they had made in one of the riverbeds. We stopped in the desert to offer an old man looking after his goats water in exchange for a photo. He drank the photo but was reluctant for the photo. He kept pointing at his stomach and we assumed he wanted some food, but when we offered him a banana he gave it back. I think it may be completely probable that he hadn’t seen a banana in his life and didn’t know that he could eat it… On the other hand he may have preferred his own odd cuisine to ours…Anyway, we snuck in a photo afterall and was off to North Horr. The women in the North dress in very in colourful and loose-fitting outfits and all of them has their heads covered. I don’t think that it due to their Muslim belief in each case, I think it may also be for protection against the heat and wind. When we drove out of the town we saw scores of people sitting around piles of maize sponsored by the USAID probably waiting for their portion for the day. It was sad to think that this was their main diet every day…and then we’re the one’s that moan about yesterday evenings leftovers. That night we drove to the one camel town called Kalacha where the guy at the campsite told us that the people in the town relied on aid relief for all their dietary needs. It was one the poorest communities, living in the driest, windiest places the rest of the world seems to have completely forgotten about. It was difficult to see the beauty of the desert in this tragic place. We left the early the next morning with a little more appreciation for the great food we get to eat every day. The road from Kalacha to Marsibit was a long and bumpy one scattered with animal carcasses. We couldn’t wait to get to Marsibit…until we got there! This town is covered in a blanket of red dust and to make matters worse the wind blows there at high velocity, every day! The ‘unattractive campsite’ described in the Lonely planet book was more like a parking area for a small hotel..luckily the GPS had a better option. Driving the road South from Marsibit to Isiolo, we decided that it might have been the worst place we visited considering that both roads going there was horrible and the place was pretty much dusty, rowdy and way too windy! 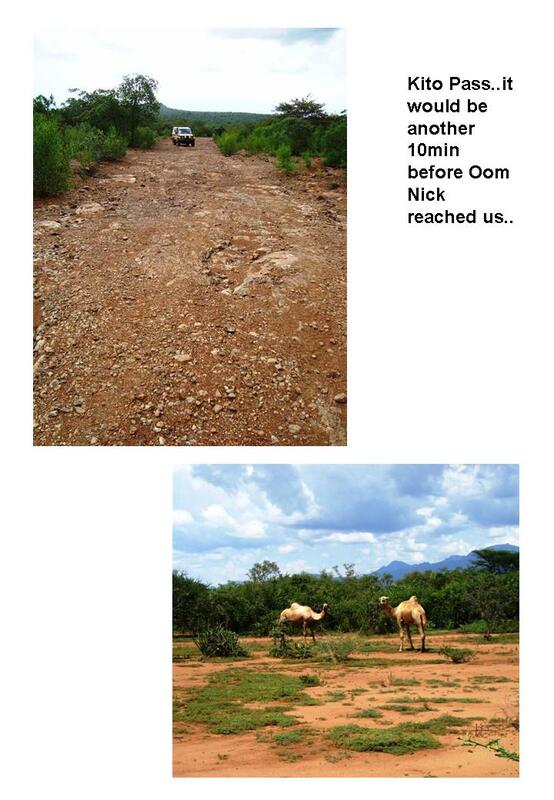 Before I just skip to Isiolo I just want to pause at the road between Marsibit and Isiolo. It was THE worst road we encountered on the whole trip (So far, but I don’t want to see the road that could beat that one!). The 130km stretch had truck corrugations that was 700mm apart and 60mm high…it took us what felt like forever. 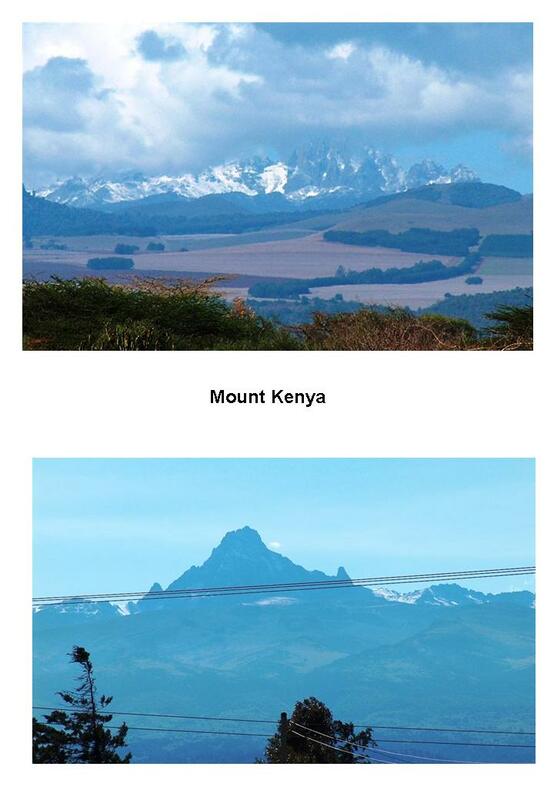 From Isiolo we drove to the Mount Kenya area where we slept at a place called Nanyuki. We got a nice view of the mountain the morning on our way to Nairobe and although covered in clouds we gathered that it was very high. Oom Nick took a few nice photos that I include here. As usual we drove into Nairobe on a Sunday like we did in every major city. It was the 25th September, Tan Lils birthday. We routed the GPS to Jungle Junction which was apparently the best place to stay in the city. We almost felt at home with all the roadworks in progress in Nairobe and had to make some rather lengthy detours to try and keep to the road the GPS wanted us to use. Getting there we found ourselves surrounded by overland vehicles, most locked up and waiting for the next trip. There were a few nice looking cruisers and some oversized trucks with all the luxuries you miss from home. Oom Nick and Marius was in heaven…That night after driving around the whole of Nairobe we went for a nice dinner to celebrate Tan Lils birthday. We were planning to go to Carnivores, the famous grill house also found in SA, but they were soo overpriced that we tried to find some of the restaurants mentioned in our Kenya book…We drove from the place to place to find out that the one closed down four years ago, the other we couldn’t find and the third was lost to my bad directions. When we finally decided to just go to the KFC around the corner from JJs, we took a shortcut road that turned into bumper to bumper traffic. After around three hours of trying to eat, we finally got to a shopping centre with a Italian restaurant where we had some pizza. The next day we drove to the border for part two of the trip through Tanzania…this one includes Zanzibar…..
Dis baie opwindend vir ons hier aan die Suid punt om te dink julle is oppad in ons rigting. Ons gun julle elke oomblik van die reis maar sjoe, ons mis julle! Dit bly elke keer wat ek van jul ekspidisie lees so ‘n groot voorreg om hierdie reis met julle te deel. Hier by ons is dit nou ook volstoom somer, maar ek is steeds dankbaar vir die 30 grade hier as ek kyk waardeur julle gaan. Deb’s en tannie Lilian – GENIET ZANZIBAR!!! Mag jul ‘n veilige, voorspoedige terugtog hê. Tot ons weer gesels. Hi julle, lekker om weer te on lees van al jul wedervaringe! Ons is gesond diekant, dankbaar dat dit sover ons weet julle ook almal gesond is en dat julle dit BAIE GENIET!.Sjoe dit is darem ‘n ongelooflike ervaring wat julle beleef, wens ons was daar, maar in gees elke oomblik met julle. Dis net die sterk verlange wat nou baie kou aan ‘n mens, so ek sal nie eers probeer wegsteek dat Paps en ek BAIE BLY is dat jule oppad terug is nie, ons sien so uit daarna om jule weer by ons te hê! Ons dra julle op aan ons Hemelse Vader vir julle veilige terreis. Geniet die pragtige omgewing en die see!! Baie liefde aan julle tweetjies en ook aan Lil en Nick – ek haal my hoed af vir hulle twee, klink my julle is ongenadig met hulle twee!. Kan nou nog nie glo julle het dit gedoen nie! Dit voel steeds soos ander aand se “eendag as ek groot is” se laaaatnag braaivleis stories! Geniet elke oomblik!